St Simon Stock was born in 1164 in England (possibly Aylesford). According to legend, from a young age, Simon lived as a hermit in the hollow of a tree (or stock) and soon he became known as Simon (of the) Stock. 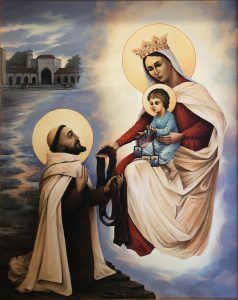 Tradition has it that he received The Brown Scapular from Our Lady of Mt Carmel in an apparition on 16th July 1251. He is believed to have lived at Aylesford, a place that, in 1247, hosted the first General Chapter of the Carmelite Order held outside the Holy Land. The monastery of Carmelite Friars now is situated on that site. Saint Simon was probably the fifth or sixth Prior General of the Carmelites (historical evidence suggests perhaps from about 1256-1266). During his service, the order spread widely in Southern and Western Europe, especially in England. St Simon Stock died 16thMay 1265 in Bordeaux, France where his bones are still preserved in the Cathedral. A tibia was brought to England in the 1860s for the Carmelite church in Kensington, but some of his relics are kept at Aylesford Friary. His Feast Day is 16thMay. St Simon Stock Roman Catholic Church in Walderslade is a Parish with a 50-years-long tradition. Our Parish gathers Catholics mainly from Walderslade and Lordswood. Weekly, there are up to 350 of us who come to St Simon Stock Church and St Benedict’s Primary School Hall in Lordswood for Sunday Mass. However, on big Church Solemnities, like Christmas and Easter, there may be up to 500 of us worshiping together. Coming to one of our Masses for the first time, you will quickly realise that we are a very family orientated community where everyone is made welcome, so please don’t hesitate to introduce yourself to Fr Bart and mention to him whether you are only visiting us or you have recently moved into the area and you wish to join this Parish.